The ark is admitted by the apostle to have been a distinguished type of Christ. For a hundred and twenty years, "God waited patiently in the days of Noah while the ark was being built. In it only a few people, eight in all, were saved." The history leads us to suppose that the whole of this period was taken up in building the ark. In the infancy of the 'building arts' such a vessel must have cost immense labor, and it was so unpopular an undertaking, that few if any besides the family of Noah would be induced to engage in the the work. His sons were born about twenty years after the building commenced, and for a long time they could afford him no assistance. Cheered by the society and counsel of his venerable father and grandfather, he wore out the hundred and twenty years in patiently waiting for the fulfillment of the prediction. When the ark was finished, God brought all the creatures into it and shut Noah and his family inside. The old world is devoted to destruction. The waters are to rise and rage above the highest mountains. No vessel had yet been invented to ride the waves. How can any escape? God only can find out the way. He causes an ark to be constructed, in which his friends find refuge, while the waves of wrath sweep away a wicked world. Who that turns his eye towards this frightful scene, is not reminded of that spiritual ark in which the friends of God are sheltered while the floods of vengeance sweep away an unbelieving world? This prepares the way for us to meditate on the conduct of Noah while laboring for that refuge, and the conduct of that profligate generation who cast contempt on him. The things most worthy of notice in respect to Noah, are his faith, his obedience, his patience, his self-denial, and his fortitude. Matthew 24:37-39 "As it was in the days of Noah, so it will be at the coming of the Son of Man. 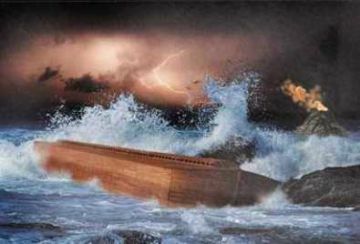 For in the days before the flood, people were eating and drinking, marrying and giving in marriage, up to the day Noah entered the ark; and they knew nothing about what would happen until the flood came and swept them all away! That is how it will be at the coming of the Son of Man!"